Aphasia is an acquired language disorder that impacts expressive and receptive language.1 More than half of people with aphasia (PWA) suffer from depression one-year post-stroke.2 PWA already experience difficulty with communication and therefore it is critical to determine whether they also have hearing loss. Undiagnosed hearing loss could jeopardize the efficacy of intervention and determining the severity of the aphasia. 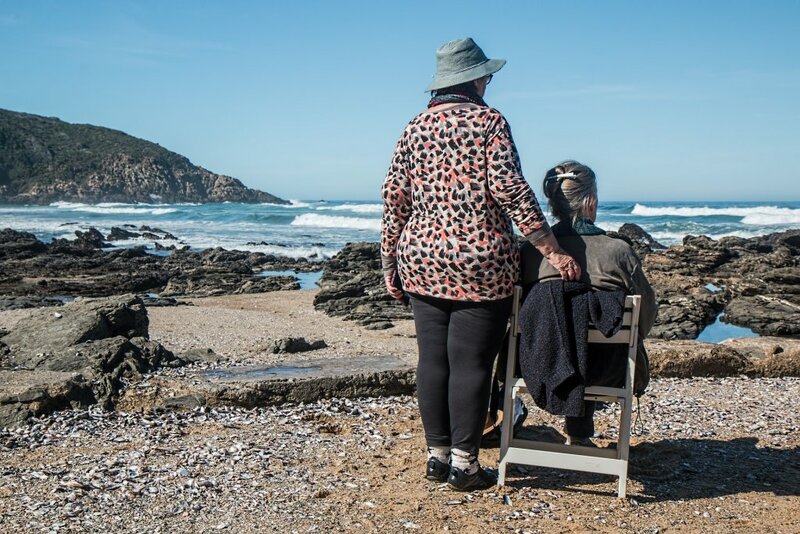 Untreated hearing loss is associated with depression, frustration, and social isolation.3,4 Consequently, people with both aphasia and hearing loss are at high risk for isolation and depression. For these reasons, PWA should routinely have their hearing screened. The purpose of this project was to identify potential hearing loss in PWA at the AI and to provide them with information regarding follow-up. It was also undertaken to determine the feasibility of using a communicatively accessible hearing handicap questionnaire (CAHHQ) with PWA. Forty-seven PWA (18 female, 29 male) with no previous diagnosis of hearing loss, at the AI, participated in the hearing screenings and consented to use of their information for research purposes. Participants ranged in age from 42–93 years (M = 66 years). Stroke was the cause of aphasia in 86% of cases. Severity of aphasia ranged from mild to severe (8 mild, 10 mild–moderate, 11 moderate, 11 moderate–severe and 7 severe). All documents were adapted into communicatively accessible format. Since PWA prefer written material that contains graphics,9,10 pictographic images developed at the AI were used to support the written text. Text consisted of short sentences, large print, and bolded key words (see Appendix A). The CAHHQ was constructed based on some questions as well as format of the HHIE–S11. Questions used were selected to identify perceived handicap resulting from hearing related difficulties. Nine PWA ranging from mild to severe provided input into the CAHHQ and agreed the final resource was helpful and appropriate. Eight S-LP students at the University of Toronto administered the screenings and the CAHHQ under supervision of an audiologist and speech-language pathologist. Students were taught SCA™ before the screening was implemented. Hearing was screened at 25 dB HL at 1000, 2000, and 4000 Hz bilaterally using portable audiometers. Participants received either a “pass” or “refer” result. Results were conveyed using SCA™ strategies and participants were provided with a communicatively accessible resource that reiterated results and recommended follow-up information. The resource also provided a means for PWA to share results and initiate discussions with family and healthcare providers. All participants successfully completed the pure tone screening and CAHHQ. 70% of participants received a “refer” result on the pure tone screening and 30% “passed.” A one-way analysis of variance (ANOVA) was conducted on the age of the participants using pass/refer as the factor. The results were highly significant (F= 7.489. p= .009) indicating that receiving a “refer” result on the pure tone screen was related to age. Results of the pure tone screening were not related to the severity of the aphasia suggesting that participants did not receive a “refer” result because they did not comprehend the task. To determine whether the total score on the CAHHQ was related to the results on the pure tone screening, an ANOVA was conducted on the total scores using pass/refer as the factor. The results were significant (F = 6.519, p = .01) suggesting that people receiving a “refer” result on the screening perceived themselves as “handicapped” by their hearing. A communicatively accessible hearing screening with PWA ranging from mild to severe was successfully implemented. It is not surprising that 70% of participants received a “refer” result on the pure tone screening, and that a “refer” was related to age. Previous studies have reported prevalence rates of hearing loss exceeding 80% in people 70+ years of age12 and the average age of participants in the current study was 66 years. Follow-up is needed to determine whether those receiving a “refer” result actually have hearing loss. 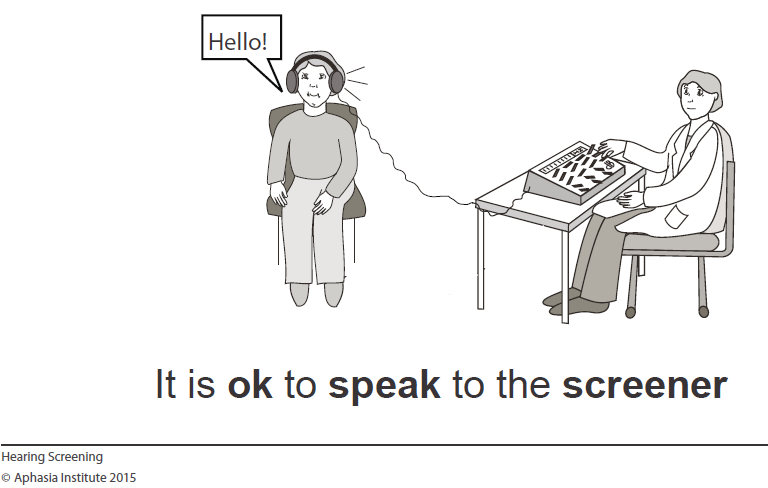 Given the language difficulties of PWA, successful use of a hearing handicap questionnaire is encouraging. Using communicatively accessible resources is not just important for screenings, but also for hearing assessments, hearing aid evaluations, and the fitting of amplification. It is critical that the competence of PWA is acknowledged and they are involved in any decision making. Unfortunately, PWA have their competence questioned by healthcare providers,5 and health information is frequently provided without consideration of their communication needs.14 The onus is on professionals to ensure that PWA are not excluded from active participation in the hearing aid uptake process. The authors acknowledge this was a feasibility study. There was no control group to determine what percentage of PWA could successfully complete the same protocol without use of communicatively accessible materials. The combined impact of aphasia and hearing loss could result in potentially devastating emotional and social consequences. Hearing screenings should be a routine part of care for PWA. Use of techniques such as those included in SCA™ must be employed in hearing screenings so that PWA can fully participate in the process and have access to all hearing health care services with decision making power. Parr S, Byng S, and Gilpin S. Talking about aphasia. Buckingham, UK: Open University Press; 1997. Kauhanen ML, Korpelainen JT, Hiltunen P, et al. Aphasia, depression, and non-verbal cognitive impairment in ischaemic stroke. Cerebrovascular Diseases 2000;10(6):455–61. Chia EM, Wang JJ, Rochtchina E, et al. Hearing impairment and health-related quality of life: the Blue Mountains Hearing Study. Ear Hear 2007;28(2):187–95. Helvik AS, Jacobsen G, and Hallberg LR. Psychological well-being of adults with acquired hearing impairment. Disabil Rehabil 2006;28(9):535–45. Kagan A and LeBlanc K. Motivating for infrastructure change: toward a communicatively accessible, participation-based stroke care system for all those affected by aphasia. J Communicat Disord 2002;35:153–69. Kagan, A. Revealing the competence of aphasic adults through conversation: A challenge to health professionals. Topics Stroke Rehabil 1995;2:15–28. Kagan A. Supported conversation for adults with aphasia: methods and resources for training conversation partners. Aphasiology 1998;12(9):816–30. Kagan A, Black SE, Duchan JF, et al. Training volunteers as conversation partners using “supported conversation for adults with aphasia” (SCA): A controlled trial. J Speech Language Hear Res 2001;44:624–38. Rose TA, Worrall LE, Hickson LM, and Hoffmann TC. Exploring the use of graphics in written health information for people with aphasia. Aphasiology 2011;25(12):1579–99. Rose TA, Worrall LE, Hickson LM, and Hoffmann TC. Guiding principles for printed education materials: Design preferences of people with aphasia. Int J Speech-Language Pathol 2012;14(1):11–23. Ventry IM and Weinstein BE. Identification of elderly people with hearing problems. ASHA 1983;25(7):37–42. Cruickshanks KJ, Wiley TL, Tweed TS, et al. Prevalence of hearing loss in older adults in Beaver Dam, Wisconsin: The epidemiology of hearing loss study. Am J Epidemiol 1998;148(9):879–86. Rankin E, Newton C, Parker A, and Bruce C. Hearing loss and auditory processing ability in people with aphasia. Aphasiology 2014;28(5):576–95. Rose T, Worrall L, and McKenna K. The effectiveness of aphasia‐friendly principles for printed health education materials for people with aphasia following stroke. Aphasiology 2003;17(10):947–63. Lisa Samson, MHSc (C) is a Speech-Language Pathologist and has been working at the Aphasia Institute for the past 10 years. Lisa works within the life participation approach. She trains health care professionals and volunteers in Supportive Conversation for Adults with Aphasia (SCA™). Lisa facilitates support groups and is also responsible for creating aphasia friendly/ communicatively accessible resources. She is working to expand the reach of the Aphasia Institute in reducing language barriers and promoting full life participation for adults with aphasia. Joanne DeLuzio has practiced as an audiologist in various facilities around the GTA for 35 years. Jo holds a PhD from the University of Toronto in Speech-language pathology, and has been teaching in that program for almost 20 years. In her view, ignorance and audism as well as long-standing systemic racism continue to be the greatest barriers for accessibility for people who are d/Deaf or hard of hearing. Difficult to legislate attitude!